Scores of people have sweated off the after-effects of Christmas in one of Britain's wackiest races. More than 180 competitors ploughed through the estuary mud across the mouth of a river in Maldon, Essex. 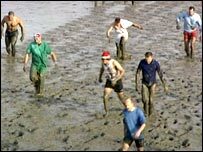 The Maldon Mud Race, run annually across the River Blackwater, raises tens of thousands of pounds of charity. Thousands watched racers run, stumble and crawl across the 400-yard course at low tide and emerge caked in mud from the estuary flats.